The Coca-Cola Company (KO): Are Hedge Funds Right About This Stock? Hedge funds run by legendary names like Nelson Peltz and David Tepper make billions of dollars a year for themselves and their super-rich accredited investors (you’ve got to have a minimum of $1 million liquid to invest in a hedge fund) by spending enormous resources on analyzing and uncovering data about small-cap stocks that the big brokerage houses don’t follow. Small caps are where they can generate significant outperformance. That’s why we pay special attention to hedge fund activity in these stocks. The Coca-Cola Company (NYSE:KO) investors should pay attention to an increase in hedge fund interest lately. Even though KO isn’t one of the 30 most popular stocks among hedge funds (see the list here), it is one of the 20 dividend stocks that billionaires are piling on. Let’s view the key hedge fund action encompassing The Coca-Cola Company (NYSE:KO). At Q3’s end, a total of 43 of the hedge funds tracked by Insider Monkey held long positions in this stock, a change of 10% from one quarter earlier. 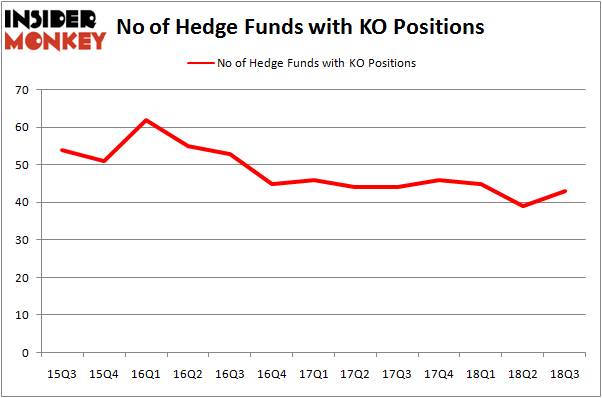 The graph below displays the number of hedge funds with bullish position in KO over the last 13 quarters. So, let’s check out which hedge funds were among the top holders of the stock and which hedge funds were making big moves. The largest stake in The Coca-Cola Company (NYSE:KO) was held by Berkshire Hathaway, which reported holding $18.48 billion worth of stock at the end of September. It was followed by Yacktman Asset Management with a $655.7 million position. Other investors bullish on the company included Adage Capital Management, Two Sigma Advisors, and Renaissance Technologies. As one would reasonably expect, specific money managers have been driving this bullishness. Renaissance Technologies, managed by Jim Simons, established the most valuable position in The Coca-Cola Company (NYSE:KO). Renaissance Technologies had $186.9 million invested in the company at the end of the quarter. George Soros’s Soros Fund Management also initiated a $11.5 million position during the quarter. The other funds with new positions in the stock are Jeffrey Talpins’s Element Capital Management, Glenn Russell Dubin’s Highbridge Capital Management, and Lee Ainslie’s Maverick Capital. Let’s also examine hedge fund activity in other stocks – not necessarily in the same industry as The Coca-Cola Company (NYSE:KO) but similarly valued. We will take a look at Oracle Corporation (NASDAQ:ORCL), Merck & Co., Inc. (NYSE:MRK), Toyota Motor Corporation (NYSE:TM), and Citigroup Inc. (NYSE:C). This group of stocks’ market caps match KO’s market cap. As you can see these stocks had an average of 54.5 hedge funds with bullish positions and the average amount invested in these stocks was $6.21 billion. That figure was $20.66 billion in KO’s case. Citigroup Inc. (NYSE:C) is the most popular stock in this table. On the other hand Toyota Motor Corporation (NYSE:TM) is the least popular one with only nine bullish hedge fund positions. The Coca-Cola Company (NYSE:KO) is not the least popular stock in this group but hedge fund interest is still below average. This is a slightly negative signal and we’d rather spend our time researching stocks that hedge funds are piling on. In this regard C might be a better candidate to consider a long position. Is Mohawk Industries, Inc. (MHK) Going to Burn These Hedge Funds? 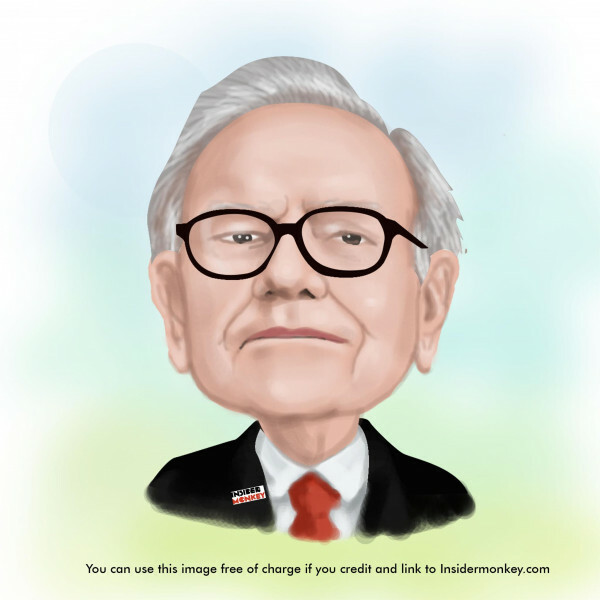 Here is What Hedge Funds Think About Movado Group, Inc (MOV) Billionaire Leon Cooperman’s New Stock Picks HMI Capital’s Returns, AUM and Holdings 20 Dividend Stocks That Billionaires Are Piling On Is MGM Resorts International (MGM) A Good Stock To Buy?